For the last 20 years, Dr. Hawa Abdi and her daughters have run a refugee camp on their family farm not far from war-torn Mogadishu, which has grown to shelter 90,000 displaced Somalis: men, women, and children whose lives have been shattered by violence and poverty and who are in urgent need of medical attention. 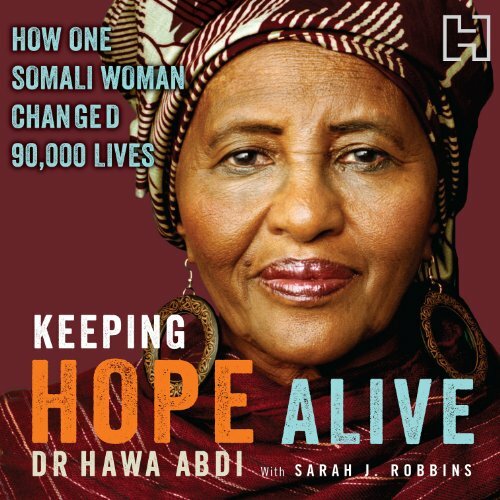 She founded a one-room clinic in 1983, but then the Somalian government collapsed, famine struck and aid groups fled. So she allowed displaced people to find refuge on her 1300 acres of farmland. As Islamist militia groups have been battling for control of the country creating one of the most dire human rights crises in the world, Dr. Abdi's camp is now a beacon of hope for the Somalis, most of whom have no proper access to health care. She was recently held hostage by a militant group who threatened her life and told her that because she's a woman she has no right to run the camp. She refused to leave. This is not just the story of a woman doctor in a war torn Islamic country risking her life daily to minister to thousands of desperate people, it's also an inspiring story of the incomprehensible bravery and perseverance of a divorced woman and her two daughters, bound together on a mission to rehabilitate a country. If you have any questions about this product by Hachette Audio UK, contact us by completing and submitting the form below. If you are looking for a specif part number, please include it with your message.